Magical elixir, nectar of the gods, however you describe it, there’s nothing quite like beer, and if you love beer, chances are that you are going to love A Brief History of Beer, brought to you by the delightful Will and Trish, who have been playfully educating audiences around the world on the storied history of fermented barley and hops since 2013. The title might call to mind images of a Hawking lecture with PowerPoint slides and interesting factoids delivered in computer-generated monotone, but quite to the contrary, this is a spirited comedy through and through, packed densely with laughs and goofy fun. Will and Trish, self-declared caretakers of the beer continuum, will welcome you aboard their beer-powered time machine and whisk you away on a quick-witted and exuberant ride through the highs and lows of the varied and fascinating history of beer. The projection screen warns the audience at the outset that this is a drink-along show, and patrons may want to have an extra beer at the ready. As the journey continues, the audience gets to participate, powering the time machine by drinking beer and engaging in health and safety procedures that greatly enhance enjoyment of the performance. Many elements of the show depend upon the chemistry between the leads and the audience, but Will and Trish skilfully drew the opening night crowd into their world. Before long, we found ourselves laughing, singing, and drinking our way through the performance. All in all, A Brief History of Beer is a celebration worthy of the beverage. A Brief History Of Beer continues at The Elephant British Pub from 6:30pm until Mon 14 Mar. The Elephant British Pub, Fri 12 Feb Magical elixir, nectar of the gods, however you describe it, there's nothing quite like beer, and if you love beer, chances are that you are going to love A Brief History of Beer, brought to you by the delightful Will and Trish, who have been playfully educating audiences around the world on the storied history of fermented barley and hops since 2013. The title might call to mind images of a Hawking lecture with PowerPoint slides and interesting factoids delivered in computer-generated monotone, but quite to the contrary, this is a spirited comedy through and through, packed densely with laughs and goofy fun. Will and Trish, self-declared caretakers of the beer continuum, will welcome you aboard their beer-powered time machine and whisk you away on a quick-witted and exuberant ride through the highs and lows of the varied and fascinating history of beer. Reaching back 10,000 years to the genesis of fermentation and moving chronologically to the present day, the audience will learn the answers to questions like, “What is a hop?” “What does a broomstick over the door mean?” and “What was Prohibition about, anyway?” The projection screen warns the audience at the outset that this is a drink-along show, and patrons may want to have an extra beer at the ready. 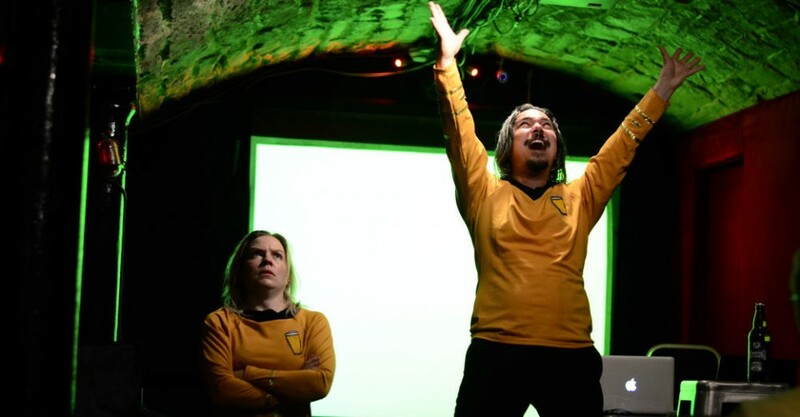 As the journey continues, the audience gets to participate, powering the time machine by drinking beer and engaging in health and safety procedures that greatly enhance enjoyment of the performance. Many elements of the show depend upon the chemistry between the leads and the audience, but Will and Trish skilfully drew the opening night crowd into their world. Before long, we found ourselves laughing, singing, and drinking our way through the performance. All in all, A Brief History of Beer is a celebration worthy of the beverage. Matt Saunders A Brief History Of Beer continues at The Elephant British Pub from 6:30pm until Mon 14 Mar. Book at FringeTIX on 1300 621 255 and adelaidefringe.com.au. Click HERE to purchase your tickets. A celebration worthy of the beverage.